Fit Health Connect : Almonds! A source of information to help you keep fit, prevent injuries from happening, and help you with therapies to get you better. Written by Dr. Derek Vinge at Fit Chiropractic in Courtenay, BC. He is a Canadian board certified chiropractor that is a qualified provider of Active Release Technique (A.R.T.) and Graston Instrument Assisted soft-tissue technique. Healthy people everywhere have new reasons to enjoy almonds as researchers have recently announced that nuts not only taste good, but they're also good for you. Almonds are one of the most nutritious of all nuts. As more and more consumers become dedicated to healthy life-styles, experts have found that adding natural foods, such as almonds, to your diet may be the prescription for physical wellness in the 21st century. Cancer Prevention - Almonds are low in saturated fat and contain many other protective nutrients - calcium and magnesium - for strong bones, vitamin E and compounds called phytochemicals, which may help protect against cardiovascular disease and even cancer. Phytochemical Powerhouse - Leading nutrition scientists presented their research findings in a symposium entitled "Nuts in a Healthful Diet", as a part of the 1998 Experimental Biology annual meeting. Dr. Gary Beecher, of the USDA-ARS, has analyzed the phytochemical content of almonds and states, "I have never seen this diversity of phytochemicals in a single food source." Reduce Heart Attack Risk - A Loma Linda School of Public Health study showed those who consumed nuts five times a week had a 50% reduction in risk of heart attack. Lower Cholesterol - In one clinical study, Dr. Gene Spiller, Director of the Health Research and Studies Center, Inc., showed that almonds added to the diet had a favorable effect on blood cholesterol levels and that none of the study groups experienced weight gain in the study. Some nuts contain rhizveritrol, the anti-inflammatory agent found in red wines and thought to be responsible for the "French paradox". Many scientists have pointed to the French consumption of red wine as one factor in the lower rate of heart disease despite their diets rich in cream sauces and buttery pastries. The fat in nuts is unsaturated, or the "good" fat and there is no cholesterol in these fats. If you think almonds are just for satisfying your mid-afternoon munchies, you're in for a surprise! These tasty tidbits pack a nutritional punch, combining tons of essential nutrients in one very delicious package. One teeny ounce of almonds contains 12 percent of your daily allowance of protein. And absolutely no cholesterol, of course. You'll also get 35 percent of your daily allowance of vitamin E, that valuable antioxidant with so many cancer-fighting qualities. And most of the fat in almonds is monounsaturated, also known as the "good" fat. This little nut is also loaded with minerals like magnesium, phosphorus and zinc, as well as lots of healthy fiber. And don't forget calcium and folic acid - they're in there too! When you get right down to the details, it's no wonder so may people go nuts for almonds! 20-25 almonds (approximately one ounce) contain as much calcium as 1/4 cup of milk, a valuable tool in preventing osteoporosis. Almonds are the best whole food source of vitamin E, in the form of alpha-tocopherol, which may help prevent cancer. If you're pregnant, or thinking about it, almonds are a great source of the folic acid you need! 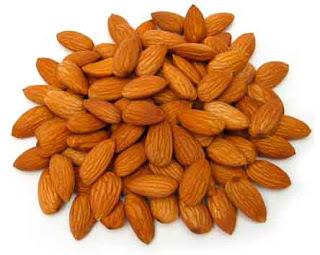 Almonds contain more magnesium than oatmeal or even spinach. Are you listening, Popeye? Build strong bones and teeth with the phosphorus in almonds. A Comox Valley community wellness chiropractor with a focus on sport and fitness. Foot pain getting you down?